Wherever you come from, this has to stir some deep folk memory genes. Oudacious! 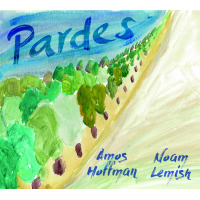 Internationally renowned jazz guitarist and oud virtuoso Amos Hoffman and world-class pianist/ composer Noam Lemish have teamed up to release Pardes, an enchanting album offering an inspired blend of jazz, North African and Latin rhythms as well as melodies that come from various Jewish communities across the Middle-East and Eastern Europe. For years, Hoffman and Lemish have been collecting Jewish melodies from different parts of the world including Kurdish, Yemenite, Moroccan, Russian, Central Asian, and Israeli songs. In Pardes they team up with a stellar Toronto-based rhythm section featuring Justin Gray on bass and Derek Gray on drums & percussion to present vibrant re-imaginings of these beloved melodies. Hoffman and Lemish, both of whom have roots in Israel but have spent much of their adult life in North America, began collaborating in January 2016. Lemish is deeply rooted in jazz and classical music and Hoffman is equally well-versed in jazz, Arab classical music, and North African vernaculars. Together they create a refreshing and compelling sound, filled with vibrant sonorities, unique instrument combinations and compelling arrangements. Pardes was released internationally on Friday, June 1st and will be celebrated with a tour of Ontario, Quebec and New York State. Adon Haslichot; At Telchi Basade; Dror Yikra; Eshal Elohay; Dalale Dalale; Äji Tü Yormä Äji; Harbi Meir; Argaman; Tchol Hamitpachat; Ets Harimon. Amos Hoffman: guitar & oud; Noam Lemish: piano; Justin Gray: bass; Derek Gray: drums & percussion; Pedram Khavarzamini: tombak; Jacob Gorzhaltsan: clarinet.